The roll-out of Norway’s largest DSO’s, Hafslund Nett’s AMM system is in its final stages. On Wednesday, 26th September the 700,000th Aidon Energy Service Device was installed to a customer and connected to Hafslund’s grid. Eltel’s installer Steffen Hille did the job with experience gained from more than 4000 installed Aidon devices. Norway is getting smarter at a swift pace: by the end of 2018, 2.9 million new electricity meters will be in operation throughout the country. Hafslund Nett’s grid in Oslo and the surrounding municipalities will soon have 715,000 new “nerve cells” which will add to reliable and predictable operation of the grid and make energy consumption transparent for the customers. After two intensive years of the mass installation phase, the AMM roll-out project is soon near to its finalisation. 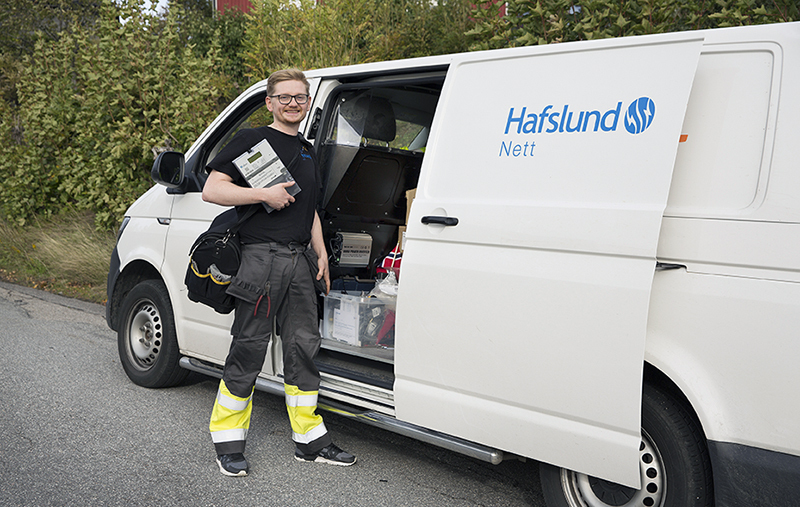 On Wednesday, 26th September the 700,000th Aidon Energy Service Device was installed to a customer and connected to Hafslund’s grid. It was the turn of Mr Øivind Helle and his house, located in Halden, to move to a smart era and get an Aidon meter. 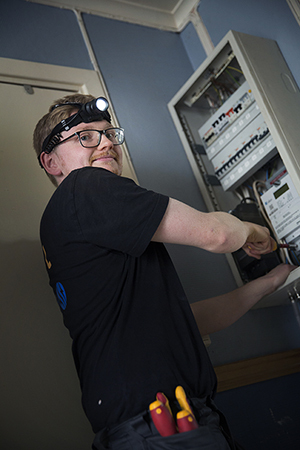 For Eltel’s installer Steffen Hille it was just another visit to a customer, among thousands of similar ones during the past two years he has worked in the project. This visit, scheduled at 16:00 clock, was Steffen’s 10th customer that day. With a well advanced routine he replaced an old meter with a new one, and after ca. 20 minutes he had completed the task and documented and reported the job to Eltel’s work order management system with his PDA. We had the chance for a short discussion with Steffen before he continued on his route to a next customer. – I have been in this project since August 2016 – for a bit over two years now. I was in the first group of installers whom Eltel hired for the main project. Before this I have been a regular electrician, with my prior experience being mainly from large building and industry projects, Steffen told us. What capabilities are needed to succeed in a job like yours, installing meters to people’s homes? – In our project we have 12-hour working days on weekdays and 10-hour days on Saturdays. You need to stand long working days, be fast and efficient and you need to be able to deal with customers. The most important skills in my opinion are to be structured, social, efficient and able to handle stress if something goes wrong. – It’s also important to be smiling and nice to the customers you meet. Most of them will be happy and nice and let you do your work alone, while some may stand next to you and complain. It’s very important to keep up a good mood so they have a positive experience of the meter change. Two intensive years of installation – it must be quite a number of devices that have gone through Steffen’s hands. But how many actually? – I do not know the exact number of meters that I have installed, but in average it’s been around 100 devices a week. Since I have worked every other week – and been off every other – it means that in total I have installed something between 4000 and 5000 Aidon meters, Steffen calculated before continuing to the next customer. There were still seven installations scheduled for him that day. The mass roll-out start of Hafslund project started in August 2016. Eltel was responsible for the mass installations of household meters. Installation of meters to distribution transformer stations was the responsibility of Infratek. In 24 months, more than 700,000 meters were delivered in time from Aidon logistics center for the project. Eltel had 5 main warehouses for storing the material. From the warehouses the meters were distributed to 61 smaller ‘satellites’ – containers which were located around the area which was to be covered by the new meters. 95% of the installers’ visits were successful during the first trial. 5% were missed due to non-availability of the customer at the agreed point of time, or due to wrong customer information. At the busiest time of the roll-out in December 2017 there were 143 Eltel’s installers working on the meter change. The maximum number of installed meters on one day was 1737 devices.